Wainscoting is one of the more traditional forms of home improvement; with an illustrious history that dates back hundreds of years. As a result, it’s the perfect way to add a touch of period elegance to your room, without doing anything too dramatic! Wainscoting involves the application of attractive, large wooden panels, which are installed on the lower section of the wall. As a general rule, they’re framed by chair rail molding, which runs between 24 and 48 inches above the ground, to create a sense of aesthetic impact in the room. The technique can vary dramatically in style; from simple wooden panels, to carved, elaborate molding. However, regardless of the style you choose, you can be confident that you’re investing in a strong architectural look, and one that really makes a statement. Not only extremely transformative, wainscoting also has the benefit of being highly cost effective; and works out considerably cheaper than extensive replastering and painting. Wainscoting requires an expert to get it right, as it’s really important to make sure that it is placed correctly against the wall. Gloger Construction offers a range of wainscoting styles; from tongue-and-groove panels to decorative, ornamental finishes, to help you create the look that you want for your living space. We take a very consultative approach, meeting with you beforehand to discuss the type of wainscoting that best suits your requirements. Whether you’re looking to create a classic Georgian style dining room, or a more contemporary, nautical feel, we’ll work alongside you to create paneling that perfectly enhances your chosen style. Installation tends to be a fairly straightforward process, and all we require is access to the wall that is being enhanced. Traditionally, wainscoting was associated with the dining area. However, in the 21st century, wainscoting can provide fabulous style in virtually any area of the home. It can add refined appeal to a hallway, create interest in an otherwise featureless living room, or make a real feature of a breakfast nook. In short, the possibilities are endless. We always strive to adopt a creative approach, and will work with you to come up with a wainscoting concept that complements your style designs; allowing you to be as imaginative and visionary as you want. After Gloger Construction complete the installation of your wainscoting, you can either keep with traditional white, or go for a touch of vibrancy with a contrasting color. In fact, this is one of the best things about wainscoting; it really allows you to unleash your inner interior designer! 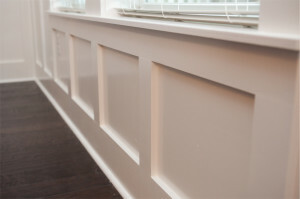 We’re passionate about improving your home and we’ve been installing wainscoting for years. If you’re looking for an expert wainscoting contractor in the Tampa area or the surrounding area, then simply call (813) 253-8746 for an informal chat about your requirements, or to arrange a visit to your home.